The answer – even though I have not been asked the question in perhaps 15 years – is high school chemistry class. My uncomprehending teacher tried to continue with the planned experiment involving a Bunsen burner even after word spread that John F. Kennedy had been shot in Dallas. Forty-seven years later, it all seems part of another world defined by black-and-white television, the black-and-white certainties of the Cold War and black-and-white racial relations. Even if he had served two full terms as president, JFK (born in 1917 and afflicted with Addison's disease) almost certainly would be long dead by now. Few remain who were close to John Kennedy (aside from his daughter, Caroline) following the deaths of Ted Kennedy last year and "ask not" speechwriter Ted Sorensen three weeks ago. Today's Americans – no matter what age – have become hardened by the shock of wrenching events from the 9/11 attacks to the assassinations of Martin Luther King and Bobby Kennedy and the shooting of Ronald Reagan. But for teenagers born after World War II, this was not how it was supposed to be in 1963. Assassination meant John Wilkes Booth and Mrs. Lincoln's evening at the theater. The visceral "where were you when Kennedy was shot?" memories of that terrible weekend in 1963 are an inescapable part of who I am today. The collective grief was different from the grief that followed the toppling of the Twin Towers because it was centered on a single man – a martyred president – rather than the thousands who died horrifically yet anonymously. At the CBS anchor desk, Walter Cronkite talked about Jackie Kennedy's blood-stained dress and showed the photo of a haggard Lyndon Johnson taking the oath of office aboard Air Force One. A trip to the local newsstand for the latest papers (as if more news would erase the horror with a page-one "Correction" box) led to a conversation with a weeping middle-aged man holding the "Kennedy Assassinated" edition of the Daily News. Unable to endure the claustrophobia of non-stop televised grief in suburban Connecticut, I somehow convinced my parents (Adlai Stevenson Democrats rather than JFK true believers) to let me go to Washington with a high school friend to mourn Kennedy. My first plane flight was the Eastern shuttle from New York to Washington, two days after Kennedy died. That bitterly cold Sunday we stood outside for more than four hours to be among the 250,000 to view Kennedy's flag-draped coffin in the Rotunda of the Capitol. (Honesty compels me to mention that my friend and I debated trying to pick up girls while waiting on line, but reluctantly decided that would be a breach of funereal propriety). The next day, we were out early enough to snag a prime viewing spot along Pennsylvania Avenue to witness the cortege and the riderless horse Black Jack on its way to the funeral then Arlington Cemetery. The image, though, that stays with me is the diminutive Haile Selassie, the emperor of Ethiopia, walking next to towering French President Charles de Gaulle behind the caisson carrying the coffin. Writing these words, I can hear the clicks of hundreds of Kodaks and the whir of a few Bell and Howell movie cameras as the mournful procession passed by. At the time, I was offended by the collective obsession with getting a picture for the family scrapbook. In hindsight, of course, I wish I had one. For decades after the Kennedy assassination, there was an irresistible urge to rewrite the history of the 1960s without the accidental presidency of Lyndon Johnson. My friend Jeff Greenfield offers a fascinating twist on this perennial what-if question in his forthcoming book, "Then Everything Changed," to be published in March. But the question of whether President Kennedy would have blundered so deeply in Vietnam has lost its urgency with the passage of time and the march of folly in other wars like Iraq. Perhaps ultimately more important is the alternate question: Would the pragmatic Kennedy have ever matched LBJ's passion for civil rights, despite the political risks for Democrats in the South and among white ethnic voters? 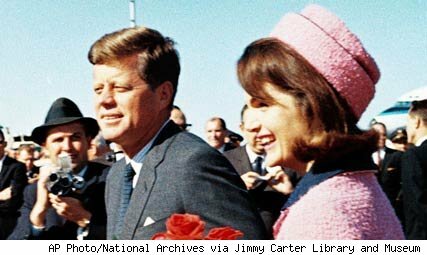 John Kennedy's thousand days in the White House was re-imagined as an idyllic Camelot, a linkage first made by Jacqueline Kennedy in an interview after her husband's assassination. The words that haunted the president's widow were those of Richard Burton playing King Arthur in the Broadway musical: "Don't let it be forgot, that once there was a spot, for one brief shining moment that was known as Camelot." In truth, no presidency could live up to such a billing, especially one that was scarred by the failed Bay of Pigs invasion of Cuba, the construction of the Berlin Wall, the initial Green Berets commitment to Vietnam and a domestic legislative program stymied by reactionary Southern Democrats in Congress. But JFK also displayed exceptional prudence in staring down the bombs-away hawks during the Cuban Missile crisis – and rightfully deserves an honored place in history as the president who averted nuclear war. And as an inspiration for a rebirth of American idealism (the Peace Corps, in particular) and as the most press-friendly of modern American presidents (JFK's press conferences were notable because he actually answered the questions), Kennedy embodied the jaunty confidant side of post-war America. Monday, on the 47th anniversary of John Kennedy's assassination, I will set aside a moment to mourn the beguiling president who defined my coming-of-age years. And I will take another moment to mourn my own youthful innocence that died on that terrible day in Dallas so long ago.